Screen not full screen..still has black borders on left and right side of screen.. I'm using a 1 operator subscription and I love the program, the only thing that I can't figure out is when I connect to any host, the viewer has two large back bars on either side of the screen. It's like the viewer cannot fill up the screen? I tried F12 and going through the different sizes, normal, stretch, full, full stretch and they all have the black bar on each side. I have tried adjusting the resolution (1366x768) on my viewer screen to a lower resolution (1024x768) but that doesn't help. Full screen stretch should enable filling the entire screen. Could you please enable this "view mode" and attach a screenshot of your entire screen. If there is personal and/or sensitive information on your desktop, you can send the screenshot to support@remote-utilities.com . I am having this problem with the stretch view not filling up the width of my viewer screen and was hoping to find an answer but not able to. It is possible to fill up the entire width of the viewer screen while in stretch view mode? By the way, so far this product does a really nice job. Apart from resolution there is also the aspect ratio. Even if you use the stretch mode Remote Utilities honors the aspect ratio so that your remote screen, albeit stretched (or shrunk) still shows correct proportions without distortion. You will not see the black bars only if the aspect ratio of your local computer is the same as the aspect ratio of the remote one, although their resolutions may differ. 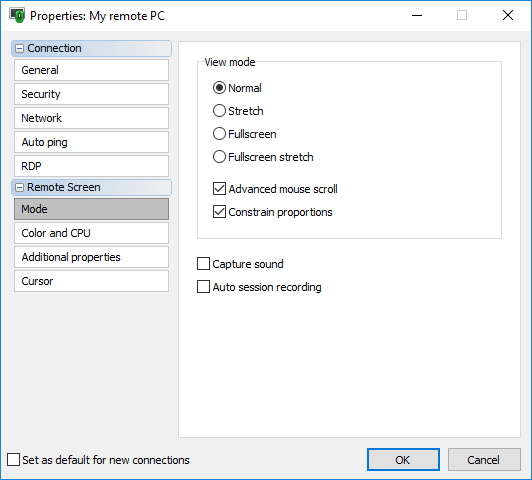 If the local resolution is higher than the remote one - stretching occurs. If the remote resolution is higher than the local one, shrinking occurs. I was able to get this problem fixed for me with the tech support help and would like to chime in on what we did..
As in my OP, I couldn't get the screen to fill the screen and even with 'Fullscreen stretch", it still didn't work, I just had to uncheck the "constrain proportions" box and the black borders on the side went away. Hope this helps you in this situation also. I'm ashamed :) Despite it was me who helped you back then, this time I completely forgot to mention this option and help Jimmy. Haha! I wasn't sure if it was you that helped me and didn't want to credit the wrong person, but I just wanted to share how we got this problem fixed for me. Conrad, thanks very much, unchecking the "Constrain proportions" did the trick. SWEET!